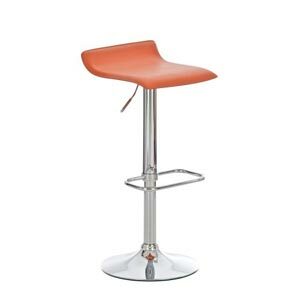 From CLP this Dyn style orange breakfast bar stool is a modern and minimal take on the classic bar stool design. With no backrest this height adjustable bar stool features an orange leatherette seat that can be adjusted from 60 cm in height up to 78 cm. Available in a number of colours this orange kitchen stool is eye catching and would look great in a set around a kitchen table or lined up along a breakfast bar. This bar stool is rotatable through a full 360° angle and is stably kept in place by its large circular chrome metal base that compliments the colourful seating area perfectly. The bar stools height can be easily adjusted thanks to the lever located under the right hand side of the faux leather seat that measures 38 x 36 cm.